According to available historical records, the earliest known ancestor for the Kernan family is Patrick Kiernan (?-1835), the great-great-great grandfather of my paternal grandfather, William G. Kernan (LIVING). What is presently known about the life and family of Patrick Kiernan will be discussed below. Very little is presently known about the early life of Patrick Kiernan. Currently available Irish records provide no details about his birth date and location, baptismal date, or the names of his parents. However, those Irish records that have been found show that Patrick lived in County Louth, which is in the Leinster Province of Ireland. One such record is the baptismal record for Patrick’s son, Felix, which shows that Patrick and his family lived in the township of Lisnawully in Dundalk Parish in County Louth. Another is the death record for Patrick, which shows that he lived in Monasterboice Parish, which was also in County Louth. Although these records do not show details about his own birth, it seems highly likely that he was born in County Louth. 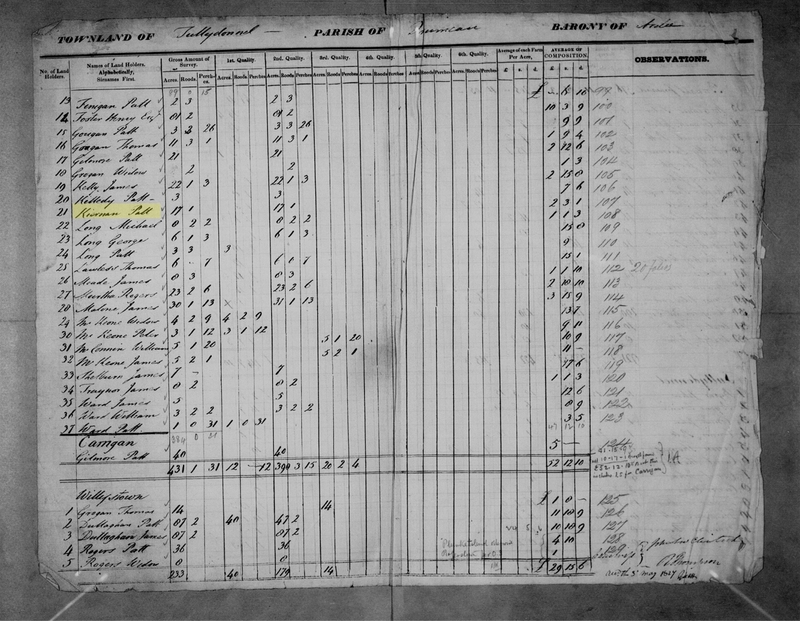 1796 Baptismal Record for Felix Kiernan showing his parents as “Patt Kiernan” and “Bidy Wire” (both highlighted yellow) and Lisnawully, County Louth as the location of where they lived. Although no marriage record has been found, moreover, it is clear from the baptismal record of his son, Felix, that Patrick was married to Bridget Wire (?-1843). Although this record provides no details indicating the precise marriage date or location, it seems highly likely that Patrick married Bridget in County Louth, possibly in Dundalk Parish, at some point in the 1780s or 1790s. The general condition and lack of availability outside Ireland of Irish historical records, including Parish marriage (and birth) records, has made finding more precise information difficult if not presently impossible. Following their marriage, Patrick and Bridget had one known child. Extensive searches into available Irish records has proven unsuccessful in identifying any additional children for Patrick and Bridget. Although every detail has not been found for their child, moreover, what is presently known is discussed below. Patrick and Bridget’s first and only known child was Felix Kiernan (1796-1882), who was born in 1796 in Dundalk Parish, County Louth, Ireland, and died on the 21 December 1882 in St. Paul, Ramsey County, Minnesota. On the 31 July 1825, Felix married Martha Rose Sheridan (1797-?) in Clonmellon Parish, County Meath (or County Westmeath), Ireland. 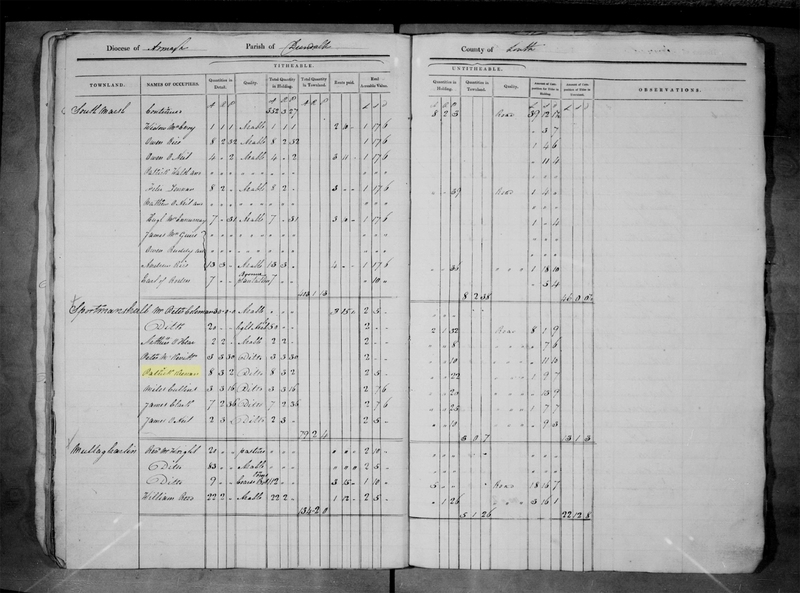 Martha was born in 1797 in Clonmellon Parish, the daughter of Owen Sheridan (?-1835) and Bridget Fitzsimons (?-1847), and died at some point between 1860 and 1865 most likely in Minnesota. Felix and Martha had at least eight children between 1826 and 1844, who were named Matthew, Bridget, Mary, Marie Anne, Owen, Rose, Catherine, and Felix. Following the birth of their second child, Felix and Martha moved their family to Nicolet, Quebec, Canada. Between 1851 and 1857, they immigrated to the United States, after which they settled in Minnesota. Throughout his life, Felix worked as a farmer. It is clear from the baptismal record of their son, Felix, that Patrick and Bridget lived in the township of Lisnawully of Dundalk Parish in the late eighteenth century. Although no historical records are currently available that shed any light on what their lives were like, general information about life in this part of Ireland is known. Lisnawully is a small, rural township outside of the city of Dundalk. At the time Patrick and Bridget lived there, it was a part of the Barony of Upper Dundalk, which was part of the lands belonging to the Earl of Roden. As a rural town, those that lived within Lisnawully were primarily involved in farming. Thus, it seems highly likely that Patrick was a farmer. Further support for this may come from the fact that his son, Felix, is known to have been a farmer in both Canada and the United States, an occupation he likely picked up as a young man working on the farm his father worked. Although it is clear that Patrick and Bridget lived in Lisnawully during the late eighteenth century, they did not remain there. Irish records show that at some point they moved to Monasterboice Parish in County Louth, which is approximately 25 miles to the south of Dundalk. The reason for their move is unclear, though it was most likely for economic reasons as crop failures and food shortages were common at the time. However, it may have also been politically motivated, depending on when they moved, as the 1798 Rebellion affected many parts of Ireland. Regardless of the reason for their move to Monasterboice Parish, Patrick and Bridget lived in a village in this parish called Kiernanscross (also Kieranscross). Like Lisnawully, this part of County Louth is rural, and farming was the primary occupation of those who lived there. Although these three entries in the Tithe Applotment Books may be possible matches for Patrick, it is unclear if any of them are indeed records for him. 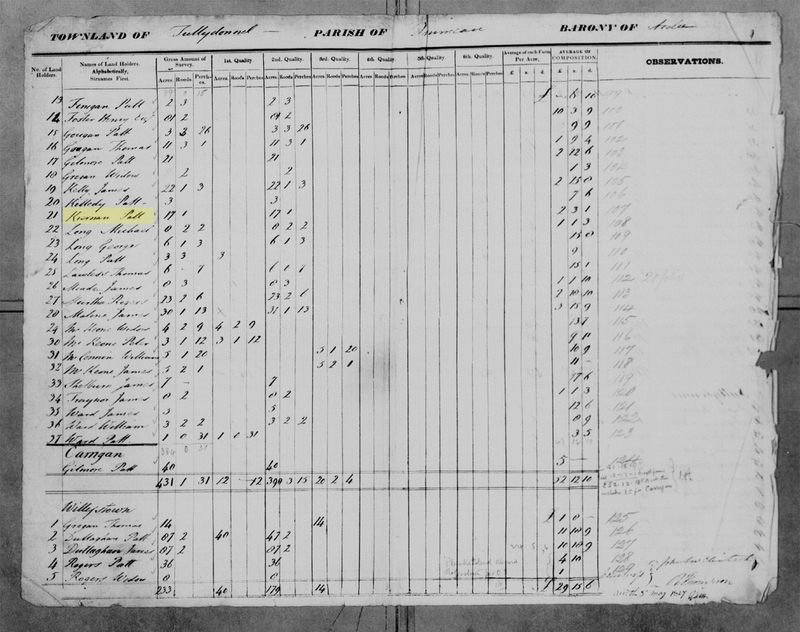 Although the 1833 entry is for someone with a similarly spelled name that lived close to where Patrick is known to have lived, it is unclear if this record is for Patrick, as it contains no additional information. It seems highly likely, moreover, that this record is for a different person than the other two, which seem to be for the same “Patt Kiernan.” As with the 1833 entry, it is unclear if the 1825 and 1827 entries are for Patrick. However, it is worth noting that Tullydonnell lies between Lisnawully and Kiernanscross. Perhaps Patrick and Bridget lived in Tullydonnell after leaving Lisnawully and before moving to Kiernanscross. Whether they lived in Sportmanshall, Tullydonnell, or just in Lisnawully and Kiernanscross, life for Patrick and Bridget was in all likelihood not unlike those of other Irish, the majority of whom were poor. In fact, the majority of Ireland’s population in the eighteenth century consisted of poor Irish Catholics. Life in eighteenth century Ireland was difficult, particularly for the Irish poor. They were primarily tenant farmers, who worked land owned by English landowners. Under penal laws, the Irish held little land, and what they did had to be divided among all male heirs, which was done to reduce the amount of land in Irish Catholic control. It also resulted in increasingly small plots that could not grow enough to support a family. Land was also overworked to meet crop demands. These factors, along with crop failures, contributed greatly to poverty, famine, and unemployment. Living conditions were poor, with most living in overcrowded, small, and poorly made homes. Their diet was primarily potatoes, buttermilk, and, when they had it, herring. These conditions frequently resulted in poor health. Those Irish that found themselves unemployed and destitute could only turn to charities or workhouses. Although it is unclear if Patrick and Bridget, or any of their children, suffered in these conditions, it is highly likely that they did given how widespread it was. Although it is unclear how long Patrick and Bridget lived in Kieranscross in the Parish of Monasterboice, it appears from Irish records that it was there that they spent their later years. Additionally, both Patrick and Bridget are recorded in parish records as having died and as having been buried in Kieranscross. According to Patrick’s death and burial record, he died in Kieranscross in April of 1835. Although the exact burial location is not recorded, this record states he was buried on the 12 April 1835 in Kieranscross. It appears that Bridget lived several more years following Patrick’s death. According to her death and burial record, she died in Kieranscross in October of 1843. As with Patrick, this record makes no mention of the specific burial location, though it does state she was buried on the 24 October 1843 in Kieranscross. Published 03/12/2018. Last Updated 03/27/2018.